The National Astronomical Observatory and the Peking University joint team found in the clusters of - Beijing Asia Satellite Communication Technology Co. Ltd. Recently, topic by a joint team of National Astronomical Observatories, Li Cai Deng led researcher, in the cluster study constant stars family model for the formation of a major breakthrough, the research results to online on January 28, published in the journal Nature. The results of the lead author Li Chengyuan in the completion of this work, is a joint PhD National Observatory (the Purple Mountain Observatory researcher China Academy of Sciences). The work is following the 2014 in the journal Nature: cluster complex constant stars family studies, in the center for Astrophysics Research and I made a major breakthrough, which makes our cluster research team for another times by the international peer attention. Almost all stars (including our sun) are initially formed in clusters, cluster stars to form has been one of the focus of modern astrophysics. Cluster is made into a group of a large number of gas through self gravitational collapse in the quality function formed the first star, but due to the initially formed massive stars blowing strong stellar winds and supernova explosion will quickly residual gas blown away, astronomers generally believe that cluster only in the birth of the first tens of millions of years to form stars. However, recent high resolution observation found that the Galactic globular clusters generally contain two or more population II stars, which makes the astronomers of stellar formation theory with suspicion. 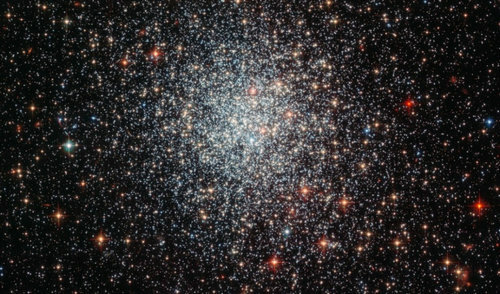 Unfortunately, due to the Milky Way globular clusters are very old, the long process of evolution makes the multiple population has already lost its formation kinetics characteristics at early stage. While astronomers to the phenomenon of multi satellite group, but for globular cluster how to create the second family, and after the stars, their evolution and other issues, there has been a lack of observational evidence and theoretical interpretation. Li Chengyuan his mentor, Li Cai Deng and Peking University Kewei science and Astronomy and Astrophysics Research Institute, Richard de Grijs Professor consciousness to the more young massive star clusters in search of evidence may be the key to solve the problem. Together they design a plan to use the observational data from the Harbert space telescope, carried out a careful study of one year. "Last winter, when I analyze the Galaxy Group NGC1783 data, I found the two age almost single stellar population." Li Chengyuan said: "belong to the same branch of stars, their age is almost the same, like suddenly formed in a moment of the past. I immediately realized that we probably found in middle-aged cluster in the second generation of stars." 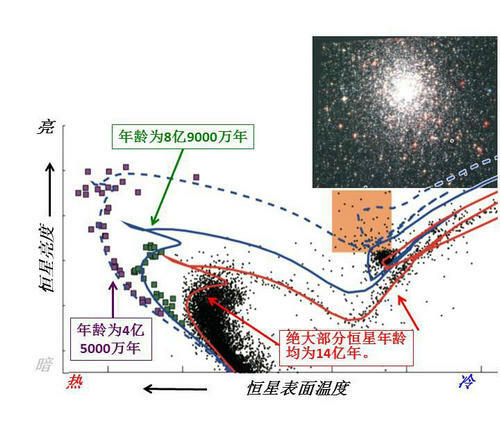 Through the dynamics analysis, Li Chengyuan found these new stars are actually clusters from external resorption and formation, and for a long time, astronomers believe that cluster is through its first generation stars explode residual gas to form a second generation of stars. The team eventually concluded: in the clusters of young stars stars might be products of foreign substances. "These stars like parasitic new members in clusters, Deng Licai explained:" now the mainstream explanation is the new stars in clusters from the internal circulation of materials, but does not seem to be self consistent." Richard, recalls: "we made a lot of the traditional framework of the model, but were ultimately excluded one one. Scientific research is like this, the new cognition in the reach always take many detours." For this, the journal Nature copyediting experts evaluation said: "in the summer of 2015 in Hawaii of the International Astronomical Union, people still globular clusters of multistar family dispute endlessly, the results come really is just right! This work opens a new window for cluster study!" This groundbreaking research by the National Astronomical Observatory of Peking University and the Kavli Institute for astronomy and Astrophysics led. The National Observatory, Yan Jun expressed highly praised: "the team long-term attention to cluster physics research, not only the use of archival data achieved continuous display of the results, the equipment is still the development and experimental study also renowned for their contribution, this is proof of the strategic development plan of the National Astronomical Observatory '35' implementation of essential to the success of the case". 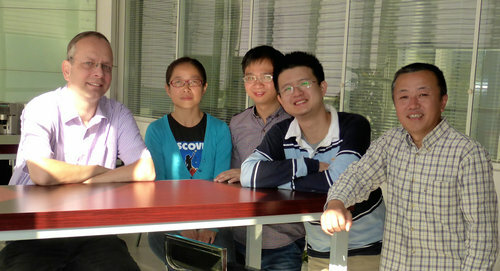 Team members include contribute to the work of Xinyu and associate professor Hu Yi. This paper co authored by Northwestern University astronomer. Found in the NGC1783 data supported and the other two young stars (green squares for the first branch; purple box, and the purple rectangle on the right side of the light red region within the spots for the second branch), they strictly distribution is calculated in terms of the two theories such as age line (blue solid line and dashed line), which means they are formed in two different time nodes in the explosive. Plus the clusters originally contained a number of stars (described by the red solid dots), the cluster includes three distinct age stellar component.